We have been using our knowledge of circuits to create useful equipment that Anne Frank could have used to protect her diary during WW2. Can you work out what she might have used these boxes for? In Year 6 we have been looking at electricity. We challenged ourselves to work out why a bulb was/wasn't lighting up in a circuit. Can you see what we needed to do? Year 6 have been practising percentages as gthey always come up in our arithmetic tests- click the picture to play percentage chains. Good luck! The Great British Wartime Bake Off! Today there was a bustling ration queue as the children of Year 6 attempted to collect their meagre rations to make their wartime shortbread. They have this evening to use the limited amounts of flour, butter and sugar to ollow the wartime recipe they have been given. Good luck Year 6! The Bake off competition winners will be announced tomorrow! This week we are practising all aspects of telling and calculating with time. What is analogue time? What is digital time? How do you read, say and use each type of time? 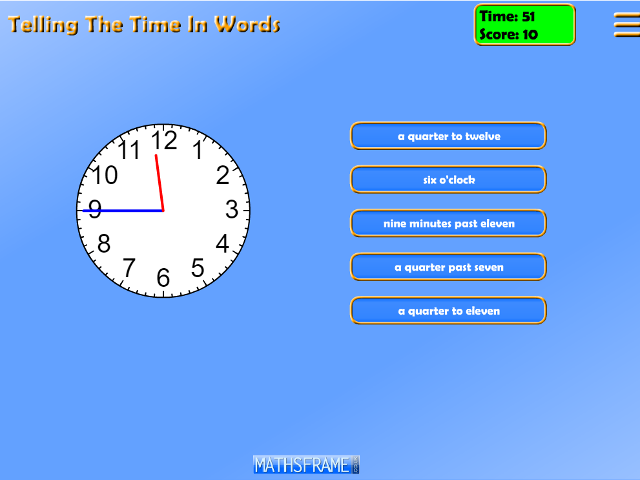 Use this Maths Frame game to practise all aspects of time. Remember to log in using our school password – check with your teacher if you have forgotten. We are very excited about our upcoming trip to Stockport air raid shelters on Friday 14th December. We have been researching all about the Blitz and how it affected major cities such as London and Manchester. We are looking forward to visiting a real life shelter and imagining what life was really like during the Second World War for the people of Manchester! This week we are writing the first draft of an information task on the Second World War. We have been busy finding out how the war began and how Britain was affected during the Blitz. Click here to find out more facts and to click the picture below to hear Neville Chamberlain's speech declaring war. Don't forget to keep checking back to see some fantastic examples of our writing! This week we are looking at comapring and ordering fractions. Click here to play the Higher or Lower game to practice comparing fractions- can you make an equivalent fraction to check? We really enjoyed sorting shapes today into Venn diagrams and Carroll diagrams. We used properties of shapes to help us to classify them, including parallelograms and perpendicular lines. Why not practise at home? Remember to scroll through to find the prime number option. Plus, bring 3 examples to prove that this trick works. Remember, you can use short division to divide by 12. Following on from today’s lesson, use the Maths Frame game that was on the board to practise will more at home. Remember that you will need to log in with the school username and password and choose ” Angles in a triangle”. We have been reading lots of poetry this week and even writing some of our own! We have looked for poetic features such as similes, metaphors, personification, alliteration and onomatopoeia! Have a go at the quiz to try and identify some examples of each. Good luck! On our visit to the Stockport Air Raid shelter and museum we went back in time…we arrived as confused evacuee children waiting to be billeted and sent to new host families…but the ARP and the Nurse showed us all the ropes and with plenty of singing and asking questions we were ready! We were delighted to welcome NAOMI OGBETA to our school to teach us how to do triple jump! Thank you so much! Thank you so much to all the parents who came to our reading workshop and learnt about the best way to support their child in the essential life skill of reading. …the sorts of books we have in our library…. …the kinds of questions we need to practice, the kind of resources we use and how to ask those questions, and finally, the children got to choose a book from the book buffet and a goodie bag to take home! If your grown up was unable to come, don’t worry, there will be another chance later in the year! Well done to Year 6 who organised fun games and activities for the rest of the school to have a go on to raise money for Children in Need…the final total is still being counted! Watch this space! Today we practised asking and giving opinions on school subjects in Spanish…what brilliant accents and confidence we are developing. What did you learn at Ghyll Head? Josh: First I t thought all the activities would be scary but once I did one activity I just kept pushing myself to do more. My favourite thing was jumping in the lake because it was something totally different – in fact I have only ever been in water in the bath or at the swimming pool! Adam: It was definitely worth it because the instructors were really helpful and kind and encouraged us to do all the activities. I felt really proud that I did the zip-wire, I was very nervous before…but it was the best feeling ever when you take a step off the platform and fly through the air! Olivia: The canoeing was definitely the best because we got to jump in the lake – when Wanessa went in first she screamed her head off! I felt really proud of myself during canoeing because I was very determined and tried my hardest to be a good leader. I think the food was amazing too,especially the desserts! Taylor-Louise: I thought Ghyll Head was a great experience because there were so many activities to do. if you didn’t want to do one or you were scared, everyone supported you to have a go. I got to know some other children well that I didn’t know before in my group, like Emmanuel. …while the boys got to play with jacks, cars, aeroplanes and toy soldiers…That’s hardly fair!!! What will you wear for the dance? We have been enjoying reading the novel “Holes” by Louis Sachar this term as part of our Survival topic. Click the picture below to complete a reading quiz after you have finished reading chapter 7. GOOD LUCK! Wow! What an experience for everyone! So many people impressed their friends, teachers and instructors by overcoming challenges, being brave and believing in themselves… Well done everyone! Using the natural resources that we collected last time, we explored some of the key elements of art to create our own work. This session we sketched the leaves paying attention to FORM…. …and finally made some natural sculptures using the laminator, paying attention to PATTERN.